AK is a 51-year-old Indonesian lady. In 2000, when AK was 35 years old, she had two seizures. She was admitted to a hospital in Jakarta. 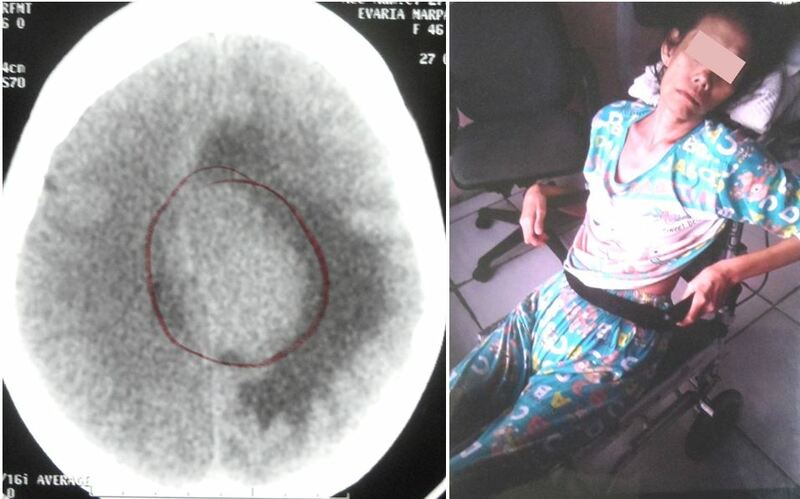 A CT scan showed a 6.2 cm mass in her brain. AK was asked to undergo an operation. The doctor said the tumour was too big and it had to be removed bit by bit, meaning AK has to undergo three operations to remove all the mass. The doctor gave her two weeks to decide. AK refused the surgery. Up to this day, 17 years later, AK is still doing fine. She has been taking two drugs prescribed by the doctor. Phenytoin: this is an epileptic drug or anticonvulsant. This drug is used to control seizures. Nitrazepam: this medication is used to treat sleeping problem and also treat certain types of seizures. AK had been on these two drugs for 17 years and they helped her. AK is a school teacher and she leads a normal life. But if she stressed herself too much she became tired and need to rest. Since AK had been taking these drugs for so many years, she felt she wanted to try some herbals and get out of these drugs. To this I cautioned AK that she should continue to take the drugs since they have been helpful for her. Why go for herbs? 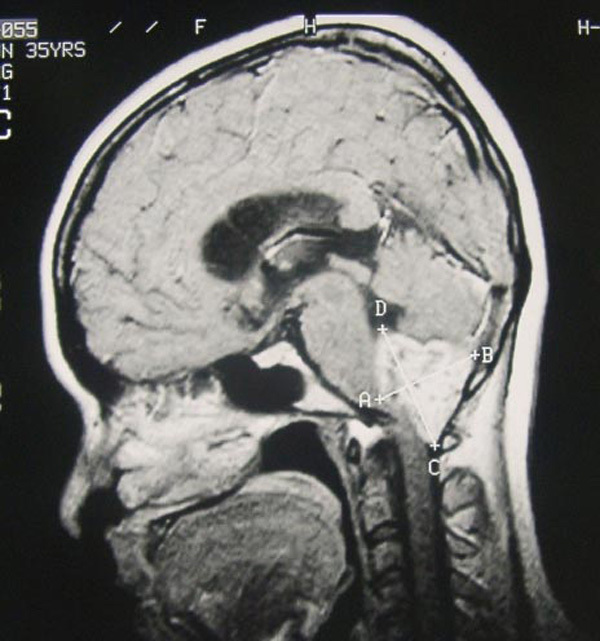 Before coming to see us, AK went for a CT/MRI of her brain (below). The mass measures 6.2 x 4.3 x 4.3 cm. It did not grow any bigger since the past 17 years. No biopsy was ever done, but according to the medical report this is a right parietal meningioma. This is the recording of our meeting that morning. This is the message I had for AK and her husband. Chris: I am very impressed with your current condition. 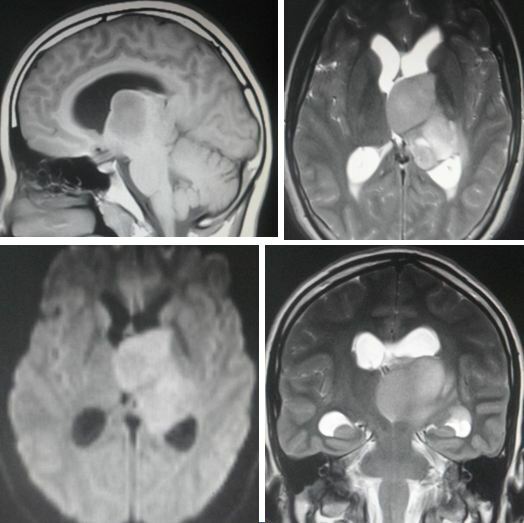 You have been living with your brain tumour for the past seventeen years. Did you suffer any problems during this time? AK: I could lead a normal life. I am a teacher and I am still teaching. But when there was too much stress I felt tired. So I had to rest. Then everything was okay after that. C: As I have said, I am really, really impressed. Then why do you come and see me? I don’t think you need to take my herbs. Just continue to do what you are doing. 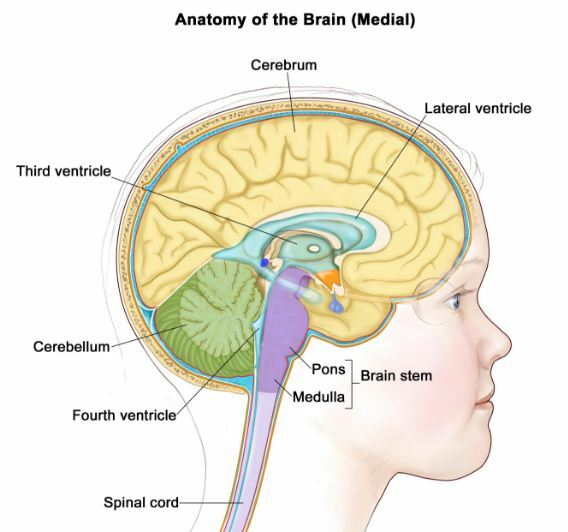 You can go into the internet and learn more about meningioma. A meningioma is a tumor that forms on membranes that cover the brainand spinal cord just inside the skull. These tumors are often slow-growing. As many as 90% are benign (not cancerous) with low potential to spread. But the growth of benign meningiomas can cause serious problems. In some cases, such growth can be fatal. But some meningiomas are classified as atypical. These are not considered either benign or malignant (cancerous). They may become malignant. A small number of meningiomas are cancerous. They tend to grow quickly. 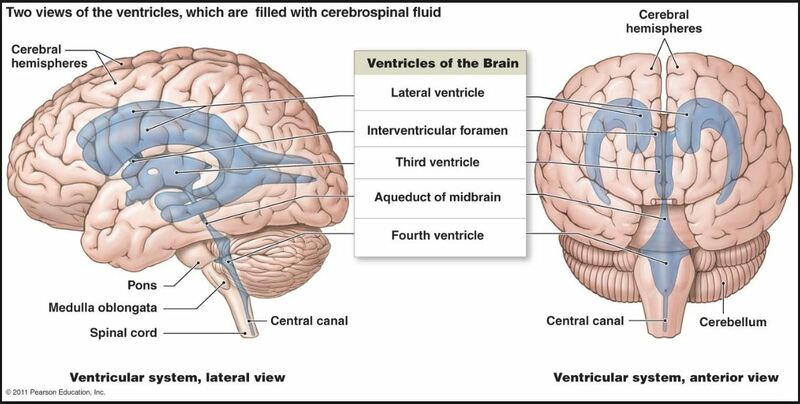 They can also spread to other parts of the brainand beyond, often to the lungs. 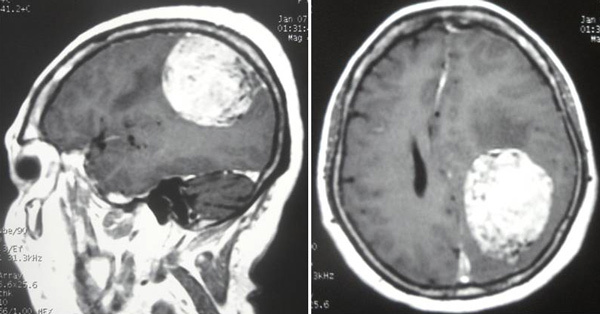 Meningioma tumors can become quite large. Diameters of 2 inches (5 cm.) are not uncommon. Because most meningiomas grow very slowly, symptoms often develop gradually, if they develop at all. The most common symptoms include: headaches, seizures, blurred vision, weakness in arms and legs, numbness and speech problems. There are three basic options: observation, surgical removal, and radiation. Observation: Meningiomas are often slow growing, increasing in size only 1-2 mm per year. If the tumor is not causing any symptoms or not impacting on quality of life, observation is often recommended. Symptoms like seizures can be controlled with medication. Surgery: If the tumor’s growth threatens to cause problems or if symptoms begin to develop, surgery may be necessary. Meningioma surgery varies from relatively straightforward to highly complex, sometimes requiring multiple surgeons from different specialties. But surgery carries significant risk of side effecta that can decrease quality of life. Radiation: This can slow or stop the growth of meningiomas. 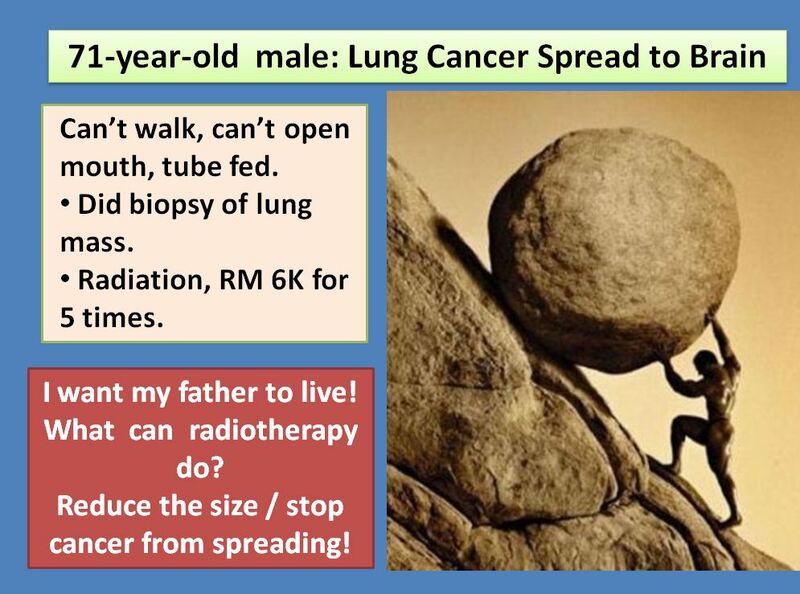 But younger patients (less than 50 years of age) need to be counselled about the risk of developing radiation-induced cancer ten or more years after radiation treatment. Surgery: For tumors in favorable locations, up to 85% of meningiomas are curable with surgery. 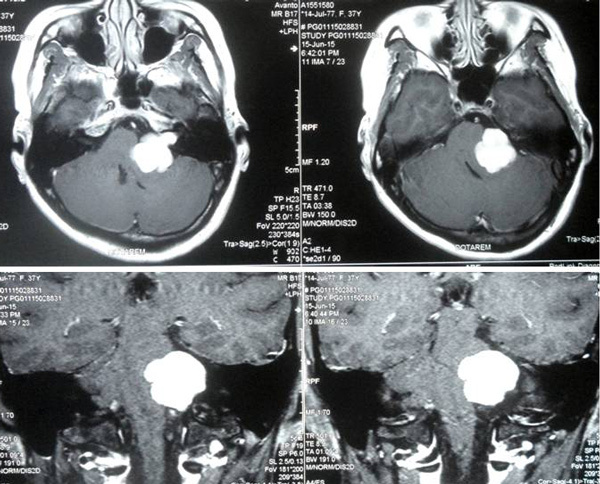 Location, the amount of the tumor left after surgery, and the skill of the neurosurgeon are the important elements in predicting a successful result. Radiation: Stereotactic radiosurgery stops the growth of meningiomas in up to 80 percent of cases. AN is a 33-year-old Indonesia. About 5 years ago he started to have headaches (but no vomiting or double vision). The problem dragged on until January 2014 when AN had a seizure at 4 a.m. He became unconscious. He woke up to find himself in the hospital. 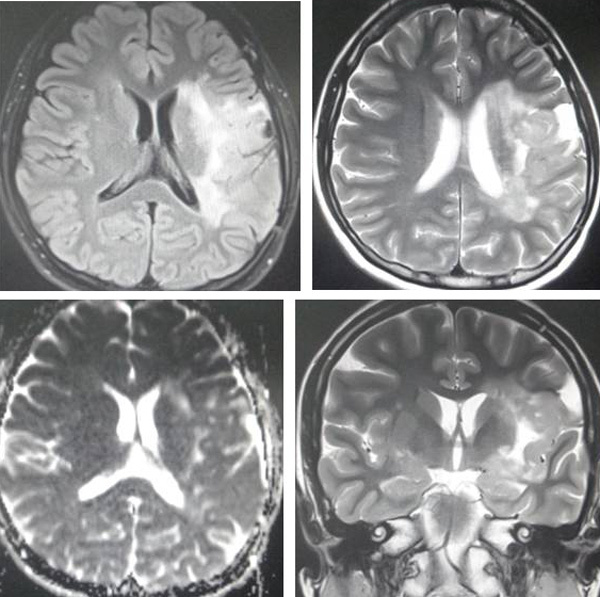 MRI showed a 4.0 x 4.2 x 4.6 cm tumour in his brain. According to the doctor it was an Astrocytoma. 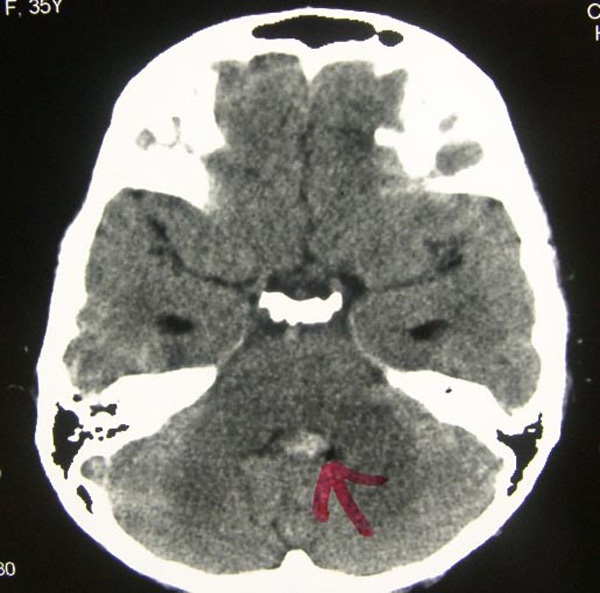 AN was referred to a neurologist who said operation was not indicated. He only prescribed AN anti-seizure medication. In February 2014, AN came to a hospital in Penang for further consultation. He was told to undergo an operation to remove the tumour. This would cost RM 25,000. In addition AN was told that after the surgery he might end up paralysed or may even lose his speech totally — i.e. become dumb. 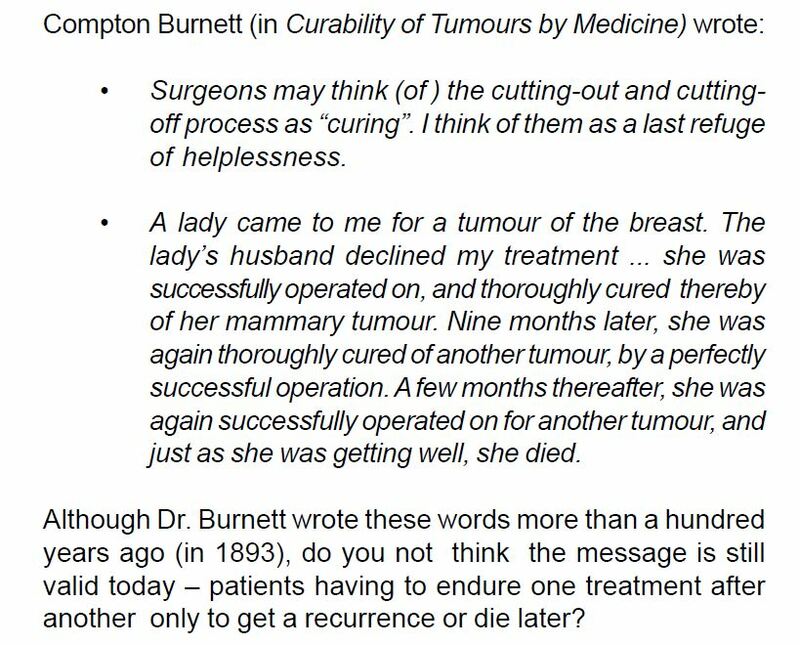 AN declined surgical intervention. AN went for Helmet Therapy (terapi helm) offered by an alternative healer in Java. AN paid IDR 11 million for the helmet which he had to wear on his head. It is supposed to “kill” the cancer cells. AN used this helmet for about one and a half years. Did the therapy helped you? AN replied: Not sure if it was good or not for me. This is because he used to have a seizure once a month, and later it progressed to once every 2 weeks and then once a week. Also the tumour had gone bigger, 4.3 x 4.7 cm. This is in spite of using the helmet. AN explained that before the Helmet Therapy, the right side of his head and body were affected during the seizure. But after the Helmet Therapy, only his head was affected. The head was pulled towards the right. The seizure usually lasted 30 seconds to a minute. His left eye became swollenl and the eye lid became narrower. In addition to the Helmet Therapy, AN also took Soursop leaf tea and Rodent tuber capsule (not from CA Care). Headache after waking up in the morning. Eyes felt numb. This lasted for about 4 hours, every morning. Sometimes felt dizzy and this may last for 3 days, all day long. Nose blocked after waking up and lasted until 9 a.m. Humming sound in left ear for about 4 hours. Sometime had difficulty breathing if sleeping flat on the back. AN and his wife walked into our centre. I could not recognised AN. He looked good and told us that his health had improved! Headache was much lighter. Before the herbs his head felt heavy and tight. Eye numbness lasted only an hour as opposed to 4 hours before. He was able to sleep very well. Ear humming only about 1 hour a day. Blocked left nose only once a week, not every day like before. Also after an hour, the blockage disappeared. Seizure became mild but occurred every day instead of once a week. During seizure it only involved pulling of the facial muscle and lasted about 30 seconds. No more draining of energy after seizure. We had warned AN that he might suffer healing crisis in the first week after starting the herbs. We told AN: Please don’t call or email us if this happen. There is nothing we can do about this. Everyone has to go through this crisis! But the healing crisis will gradually go away after a few days. Indeed, AN suffered severe headaches for a few days after drinking the herbs. He was unable to work and had to sleep all day. In fact his headache had become more serious! Although he was so afraid and uncertain of what to do next, he dared not call us because we had told him not to do that! 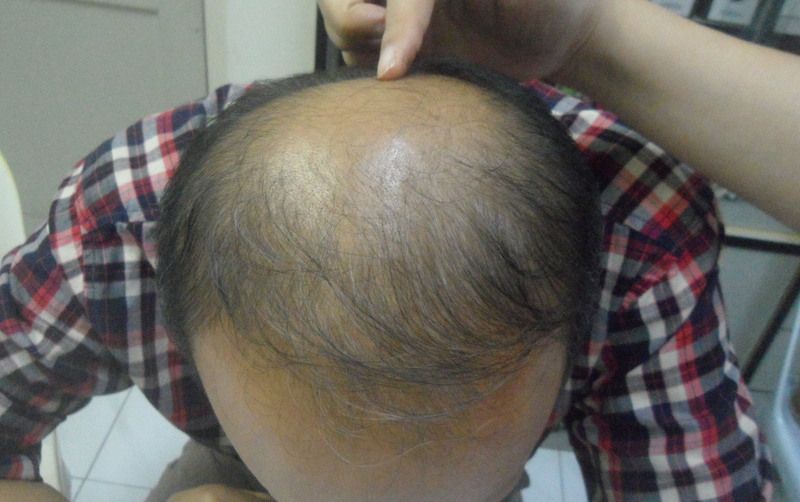 After a week, the healing crisis started to subside and his condition started to improve. By the third week, AN felt well again. And his condition improved much more than before taking the herbs. AN shared his experiences in the videos below (speaking in Bahasa Indonesia). We would like to thank AN for his permission to use these videos without having to hide his identity. Throughout her singing and acting career Olivia has exuded a positive personality and a soulfulness that have infused each of her projects with warmth and spiritual energy that for many of her fans have become her signature. Her passion for her work has translated into not only her creative projects but also the many advocacy efforts she has undertaken—ranging from environmental causes to health issues—to effect positive change in her own life and in the world around her. In the summer of 1992, Olivia felt a lump in her right breast. “I had found lumps before,” she says, “but this particular time I wasn’t feeling well, and I didn’t feel good about it.” Her doctor recommended a mammogram, which did not turn up anything unusual, yet Olivia’s instinct told her that what she was feeling was not right. Her doctor listened, and he performed a needle biopsy. Again, the result was benign. Still convinced that something was very wrong, Olivia and her doctor agreed that they would proceed with a surgical biopsy. Their final biopsy did indeed find cancer (Stage 3). Tragically; the diagnosis was confirmed on the weekend her father died of liver cancer. Following her diagnosis, Olivia underwent a modified radical mastectomy and one year of chemotherapy before her treatment was finished. She endured the side effects of treatment, which included headaches, fevers, and fatigue; and she still remembers with a shudder the anti-nausea “cocktail” she was given at the time. However, it was her decision to integrate complementary therapies into her treatment plan that Olivia says really helped her through. Working with her oncologist to ensure that none of the alternative treatments would interfere with the standard treatment protocol, Olivia had regular massage therapy as well as regular acupuncture sessions, which were especially helpful in alleviating her nausea. She also practiced yoga, meditated regularly, and consulted a doctor who was an herbalist. Each of these additional steps that she took to care for her health and her spirit, Olivia says, was integral to her healing. “It had to be more than slash and burn for me,” she says, of integrating a complementary approach. Since her diagnosis and treatment, Olivia has been a crusader for all things alternative and spiritual. The comfort Olivia found in alternative therapies when she had cancer is her reason for establishing the Olivia Newton-John Cancer and Wellness Centre in Melbourne, Australia. The Centre replaced the cancer wards at the Melbourne-based Austin Hospital and also collaborates with the New York-based Ludwig Institute for Cancer Research. In addition to traditional cancer therapies, the Centre offer patients and their families support and cancer education programs, as well as complementary therapies focusing on meditation, relaxation, massage, art and music, nutrition, exercise and aromatherapy. I owe my good health to several things particularly my wonderful doctors! A positive attitude, which is essential to ones ultimate survival, good nutrition both emotionally and in a dietary sense are invaluable. 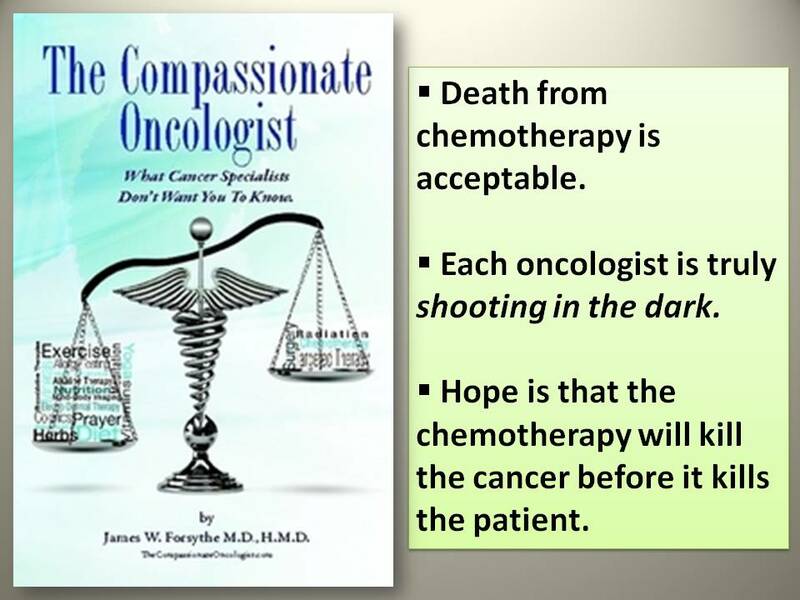 I balanced my western chemotherapy and surgery with eastern philosophies and practiced meditation, yoga and prayer. I complemented my treatments with herbs; homeopathy and acupuncture to combat my nausea and to help me stay centered and focused. Equally important were my conversations with other women who have gone through the same treatment. It helped me to understand what was ahead of me. Last but not least, the support of my family and good friends was priceless and lots of laughter–the best medicine of all!!! Olivia Newton-John has very successfully combined both Western and Eastern healing modalities and has survived 20 years already. Obviously the 2 healing methods did not clash at all. This “clashing” talk by our oncologists is certainly a lot of bull. Don’t you think so? We welcome your views. 2) Olivia Newton- John overcomes Breast Cancer!